Every year at Christmastime my family makes it a point to visit a local farm to cut down our own tree. The trees don’t look or smell any different from the ones we could get at Home Depot, but there’s something magical about walking along rows of pines, firs and spruces with your children in crisp December air. Even when we end up squabbling — “She got to pick the tree last year!” — we come away from the experience with an unshakable case of the warm fuzzies. We go to a place in Yorktown Heights called Wilkens Fruit and Fir Farm that is already an important part of our children’s Christmas memories. 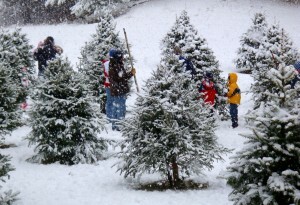 I pray those memories last a lifetime, because if the new federal estate tax rates kick in as scheduled next month, memories are probably all that will remain of our December excursions, not the tree cutting tradition itself. Such would be the recklessness of this federal government. When the Wilkens family first began plowing the farm’s soil, the grand debate in this nation was whether our boys should go “over there,” as in Europe, where nation after nation was being drawn into a war over nothing. It was 1916 and, as you walk Wilkens’ 180 acres today, it’s easy to imagine what the place must have looked like back then (pretty much the same as it does now) and to guess what its earliest workers might have been discussing while planting its first apple trees: America’s involvement in that European debacle and, the following year, the Bolshevik class war breaking out in Russia. A walk onto Wilkens is a visit to a vanishing America. One’s cheeks get rosy simply by stepping foot on the place. After a tractor ride to spot and harvest “the best tree yet,” there’s a visit to the small wood-frame store for hot apple cider, warm doughnuts and maple sugar candy. You have to be careful not to trip over Norman Rockwell at his easel on the way out, or at least it feels that way. The estate tax, or death tax as Republicans call it, may very well kill off these last vestiges of our American farming heritage. The tax is a family farm eradicator. The reason is the value of land in suburban and exurban communities. Beginning in January, everything of value a person owns over $1 million at the time of death will be taxed at a rate that begins at 37 percent and reaches 55 percent for value over $5 million. That includes houses, cars, bank accounts, comic book collections … and land. It doesn’t matter that you paid income and sales tax on your possessions while you were alive, Uncle Sam will be coming for 55 percent of everything you accumulated, over a certain value, once you’re gone. Proponents of the estate tax say it’s intended to hit those fat-cat millionaires and billionaires our president is so fond of demonizing. But the super-rich can afford to pay for intricate tax shelters. Its family farms like Wilkens that get devastated. Perched on a rise overlooking the rambling hills of northern Westchester, Wilkens is worth millions — on paper. Land developers would snap it up in a minute. But Randy Pratt and his wife, a Wilkens descendant, want to keep it a farm. They don’t want to see it turned into another condominium complex.